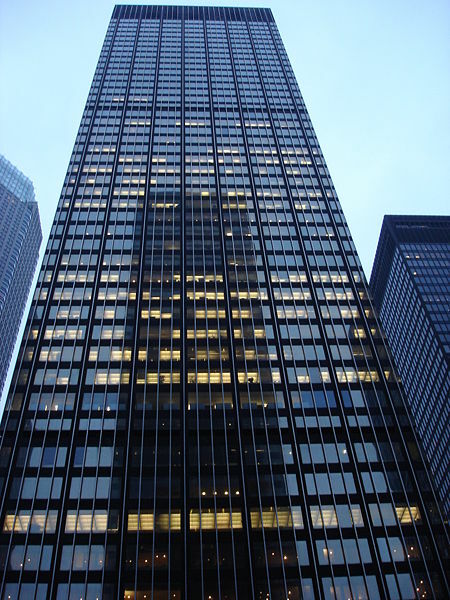 Stand in front of the JP Morgan Chase Tower at 270 Park Avenue in midtown Manhattan and you’re at Ground Zero for systemic risk in the U.S. financial markets. JP Morgan has $2.1 trillion in assets, second only to Bank of America with $2.3 trillion.It has tripled in size in the past decade. It is planning an aggressive expansion oversees. JP Morgan is the quintessential too-big-to-fail bank company. But more importantly, JP Morgan is too interconnected to fail. In 2008 JP Morgan withheld tri-party financing from Bear Stearns and Lehman Brothers, triggering their collapse – which caused the Reserve Primary money market fund to break the buck – and intensifying fears that Goldman Sachs, Merrill Lynch, Morgan Stanley and maybe even JP Morgan itself would be next. This was the seminal systemic risk most responsbile for the Federal Reserve’s dramatic intervention in the financial markets in 2008, according to Federal Reserve Chairman Ben Bernanke. -JP Morgan itself is one of the nation’s largest repo dealers, with $222 billion in loans and $263 billion in borrowings outstanding at the end of 2010. -JPM’s broker-dealer subsidiary, J.P. Morgan Securities LLC, is one of the 20 Primary Dealers authorized to do repos with the New York Fed. -Money market funds and hedge funds are critical players in the repurchase market. JP Morgan has the nation’s second-largest money market fund family and the nation’s largest hedge fund group. The JPM global bank holding company is also a leader in two other key areas of systemic risk during the crisis: Credit derivatives and securitization. Last year it had the most derivatives contracts of any U.S. bank holding company, and it was the world’s largest dealer of credit default swaps, the credit derivatives that helped fuel the housing bubble and felled insurance giant AIG. Before credit markets collapsed, JPM was the second-biggest commercial bank sponsor of asset-backed commercial paper (ABCPaper), which securitization companies sold to raise money. Some critics find JP Morgan’s trajectory under CEO Jaime Dimon disturbing because they believe the company’s size and interconnectedness gives JP Morgan an unfair competitive advantage and will force another taxpayer bailout at the next crisis. But Dimon said in the Washington Post he believes no company should be immune from failure, not even JP Morgan. Don’t know what’s taken me so long to find your site. I first wrote about Repo in my essay “The End of an Era, Part I,” from June of 2008, and my “teacher” for Repo was the head of the religion department at Columbia University, Mark Taylor, and his book “Confidence Games: Money and Markets in a World Without Redemption,” published in 2004. A truly amazing book which approaches the financial system from a truly interdisciplinary perspective.